The sweet potato is another superfood that we need to take seriously in terms of its inclusion in our weekly grocery shopping. Aptly named for being a naturally sweeter version of its white potato counterparts, the sweet potato has a ton of health benefits for our bodies that make it a must eat. Energizing carbs, beta carotene, vitamin A and vitamin B help contribute from everything to our eyes and brain, our energy levels, and even our ability to ward off cancer. Let’s take a look at all of the good these delicious potatoes can do for us. The rich, orange color that sweet potatoes have are due to high levels of beta carotene. Beta carotene gets converted into vitamin A within the body, an extremely beneficial vitamin for our brains. Studies have shown that having consistent vitamin A intake supplementation assists in cognitive function and verbal memory. In addition to the cognitive assistance that sweet potatoes provide, vitamin B6 also helps with general mental health. This vitamin aids in the production of neurotransmitters, which are chemicals that contribute to neurosignals moving amongst brain cells. The higher the intake of vitamin B6, the higher the capacity for strong mental health. Beta Carotene, along with potassium and fiber, are a combination that helps your eyesight in the long run by slowing the progress of macular degeneration in the eyes. The vitamin A from beta carotene also helps prevent dry eyes and night blindness, which when minimized help the longevity of your eyesight as well. Inflammation is often something that we don’t take seriously enough. Sure it can be tedious and hinder us temporarily, but excessive inflammation often leads to chronic injury and disease. 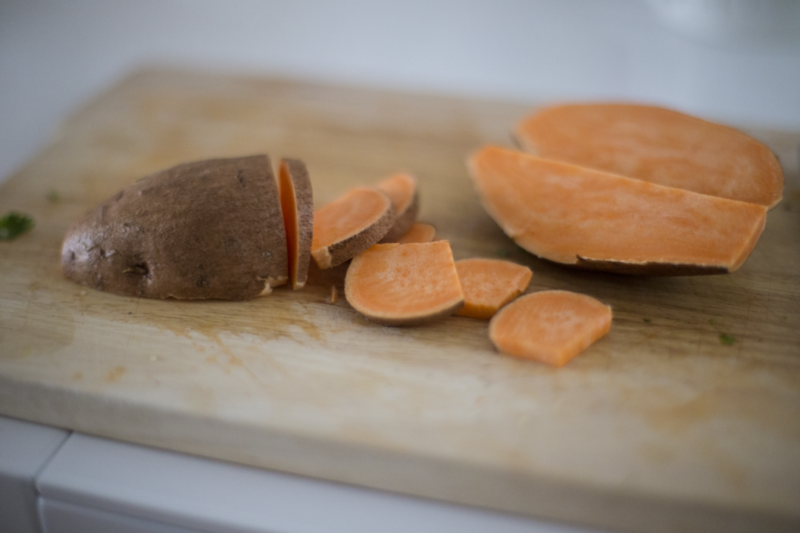 Sweet potatoes are a great way to naturally fight inflammation. There is a measurement called the “inflammation factor,” which essentially measures a food’s effect on inflammation to the body, either positive (anti-inflammatory) or negative (inflammatory). Sweet potatoes have an inflammation factor of around +230, which indicates a strong score and positive anti-inflammatory properties. Compare this with normal potatoes, which have an inflammation factor of around -250, meaning that they actually have strong inflammatory properties. The choice is simple here. Once again vitamin A hooks us up with another health benefit. Vitamin A is known for protecting the skin against UV rays, which of course helps to prevent sunburn, but also delays our skin’s aging. Vitamin A also helps produce both collagen and glycosaminoglycan, which both support in tightening the skin, supporting skin structure, and lowering the visibility of wrinkles. If you use anti-aging cream or any skin rejuvenating products, I’ll bet that it has retinol in it. This is actually a form of vitamin A! Besides vitamin A, sweet potatoes are great sources for both vitamin C and vitamin E. Vitamin C is important in the synthesis of healthy collagen, while vitamin E is an antioxidant which protects the skin against wrinkles. It also helps with the synthesis of melanin, which protects against sun damage. Beta carotene has been proven, amongst all of the health benefits we listed, to also reduce the risk of cancer. Studies have revealed that cancers such as lung, stomach, and colon have all shown reduced risks for those that have a diet high in beta carotene. Coupled with folate, vitamin C, and fiber, the risk of breast cancer in women can potentially be cut in half by having a diet high in sweet potatoes and other vegetables. Sweet potatoes are delicious, go great with any type of main dish, and fortunately, are not hard at all to make. In fact, they are simple to cook in a variety of different ways. Baked: this is the most common way to cook sweet potatoes. Simply poke a few holes into the potatoes with a fork and bake at 400 degrees for about 45 minutes. Sauteed: put a bit of oil in a pan, slice up some sweet potatoes, toss for 10 minutes and you are good to go. Grilled: this is a great method during summer months when you plan on doing a fair bit of grilling in general. Cut sweet potatoes in half lengthwise, then grill until tender, which usually takes around 20 minutes depending on your heat settings. Boiled: cut sweet potatoes into 1-inch thick slices. You can then boil by either adding slices to a skillet with about 2 inches of boiled water, or adding slices to a pot of boiled water. Cook until tender. Microwaved: now you probably will not taste the same quality in this method, but I understand that we all live busy lives and often time and convenience are the most important factors for throwing together a healthy meal. If that is the case, put a sweet potato in the microwave for about 6 to 8 minutes, rotating halfway through. Not only are sweet potatoes delicious, but they are also packed with nutrients and vitamins that our bodies need and thrive on. Rich in vitamin A, sweet potatoes promote a healthy brain, healthy eyes, and healthy skin. They also reduce inflammation, chronic injury and disease, and the risks of certain cancers. Sweet potatoes are one of the best superfoods out there. Plus, they are incredibly inexpensive. We often turn to supplementation pills to give us the required nutrients we need, when all it takes is a trip to the grocery store and a bit of cooking time to get the same nutrients naturally and inexpensively. Do yourself a favor, start adding sweet potatoes to your diet. If studies have shown significant health benefits from adding this superfood, why not experience them for yourself?